Why Am I Not Getting Any Respect? I have an employee who is 11 years older than I am and he thinks he knows more than and is more qualified than I am. He ignores my requests, won't cc me on e-mails and doesn't provide me with information about what he's working on. I've tried meeting, talking, and sending him e-mails, but nothing seems to work with this silly man. What do I do? See the adorable child to your right? 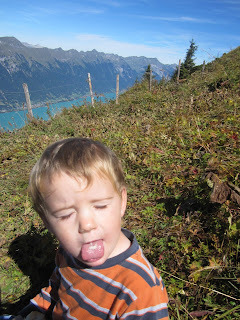 He's 2 and that was his response when we made some vague empty threat about leaving him on the mountain if he didn't come. He could safely make that response because he knew darn well that we would never leave him on a mountain. I suspect your employee responds to you much in the same way because he knows you're powerless over him. Now, you may be saying, "But I'm the manager! Of course I have power over my employees." Oh, if only it were that simple. The first question is, do you have hire/fire/discipline authority over your employees? In some companies people who are labeled "managers" completely lack the authority to do true managerial things. If you are in a situation where someone else has the hire/fire authority over this employee, then take it up with that person. But, if you are the person who (on paper) has hire/fire authority and this guy is ignoring you, then it's because he doesn't believe for one minute that he'll have any bad consequences. I mean, look at what you've done so far--met with him, talked with him and sent him an e-mail. I'm sure he just nods his head and goes about his daily business. Does this employee have more knowledge/experience than you do? This isn't a flippant question. It wouldn't be the first time someone with less knowledge and experience was made the boss. In fact, I have no problem with this at all because managing people isn't the same as being the worker. You see this at executive levels all the time. Some company will hire a new CEO that comes from a completely different industry. Why? You don't need to know how to make widgets to run a widget making company. You just need to know how to run a company and how to hire people who know how to make widgets. Use that knowledge. Remember, you weren't hired to do this employee's job. You were hired to manage this employee. Make sure your efforts to get him to "obey" and cc you on e-mails don't cause him to be unwilling to use the knowledge he has. Talk to him about what he knows. Use that knowledge. Set objectives that make sense. Sit down with your employee and set objectives and clear requirements. You said you wanted him to cc you on e-mails. Why? Frankly, it would drive me nuts if my boss wanted me to cc her on everything, and it would drive me even further up the wall if I had employees who cc'd me on everything. Presumably, your employees should be smart enough to know when to cc you and when not to. Make sure the objectives are work oriented and that they make sense, given his knowledge and skill levels. Set consequences that are realistic and be prepared to follow through. If you decide that he really needs to do X, make it clear that he must do X and if he doesn't there will be a consequence. This is not consequence of "I'll be very annoyed if you don't," but a "you will be placed on a formal performance improvement plan if you do not do X. If that does not resolve the issue you will be terminated" kind of consequence. This absolutely needs to be something you will follow through on, or don't bother saying it. Give feedback. Good and bad. In fact, more good than bad. It's in your best interest to have a hardworking, experienced employee. Don't blow it by ignoring his successes and failures. Remember that he's got the problem of working for a younger manager to contend with. This isn't an easy transition either. And you've just come in and expect to be respected. Well, the reality is, you have to earn respect. If you need help, go to your boss. That's what your boss is there for--to manage you. At the end of this, you'll either build a good working relationship with this employee or you'll have to terminate him. I honestly don't know whether you're the problem or he is. I suspect that you both have your issues. Work towards managing, let the little things go and things should get better.